The Purely Yours Express Breast Pump combines hospital-recommended technology and mom-friendly features. It’s perfect for mothers working full-time and for those who want a fast and easy breast-pumping experience. Help protect your breast milk and your baby from bacteria, mold and viruses while pumping. Ameda has the world’s only breast pump with a proven protective barrier. Proven Airlock Protection means our diaphragm keeps the air from coming in contact with your milk while pumping. No need to clean the narrow tubing. Even if the container is turned, moisture and milk aerosols will not enter the tubing or pump. Independent Speed and Suction controls make it possible for mothers to achieve a multi-phase experience. The independent adjustable controls make it possible for a mother to keep the pump set on her maximum comfortable suction level while varying the speed to more quickly trigger milk ejections. This comfortable and effective breast pump motor weighs only 1 lb. It can be conveniently powered by AC Adapter (included), 6AA batteries, or car adapter. Batteries and car adapter available separately. 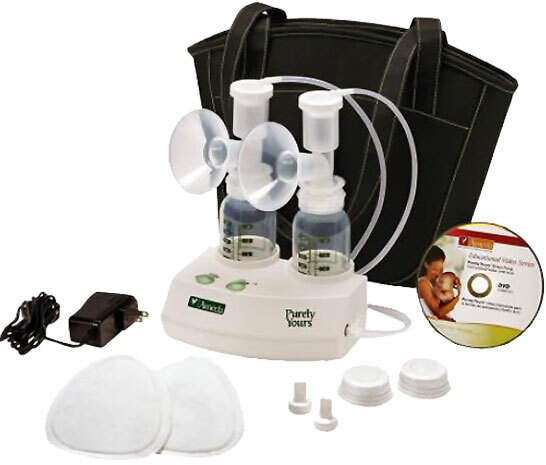 Qualify for the Ameda Purely Yours Express Personal Double Electric Breast Pump through insurance.